vacant WBU welter title. Ait Bassou was tired going into the last round and was then hurt by a left hook, he stupidly tried to trade with Makaradze but was caught in his own corner and as he fell, out of this world, the referee correctly stopped it. vacant GBU lightheavy title, Rumbolz was floored twice in the eighth. Kruhlik had two points deducted in the sixth for excessive holding. Russian lightheavy title under Pro Ring Aegis (??). 80-75 twice and 80-74. Kovalev down in the first. Kubin won the vacant GBU supermiddle title in a big upset. Trabant won the vacant GBU jr middle title with a wide points win but how did Hengstberger last the distance? Polish Int´l lightheavy title, scored 99-92, 98-94 and 100-91. WBC Youth (I/C?) heavyweight title, scored 96-94, 97-94 and 96-96. WBC Baltic title. Mendoza was floored in the first and twice more in the ninth. cancelled the day before but before the weighin due to illness of Boytsov. Özen won the Int´l German title as Bilak hurt his left arm after missing badly with a punch. Sebastian Real, 90,1, weighed in but was apparently replaced by Gromov, who flopped over in the first. Ruso floored and later stopped as Said poured it on. Lihet, weightwatcher of the year, fights at jr middle here, was at jr welter two weeks earlier and won a Euro title in the amateurs at 52 kg. Gavern came in on a week´s notice for Odlanier Solis, was floored twice in the fifth for a stoppage, vacant TWBA title at stake. fight off at the scales as it seemed as if Casal came to fight for the TWBA jr welter title while Bento came to fight for the WBO Euro lightweight title. De Donato retained the Italian jr welter title on scores of 100-90 and 99-91 twice. Seferi retained the WBO Euro title. Cedric Spera, 71,2, Bel W 4 Jorge Ortiz, 71,2, Col/? 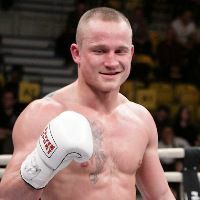 Forsman won the vacant Finnish cruiserweight title with a one punch knockout. Mononen was hurt right away and never recovered. Baysangurov retained the WBO jr middle title on scores of 117-111, 118-110 and 119-109 interim champ Lukas Konecny. Konecny was badly cut over the left eye in the 12th. 78-74 (Semernin), 76-76, and 78-76 (Sutidze). 77-75 and 78-74 for Chervyak and 78-75 for Jabbarov. 77-76 twice and 79-73 for Bihovtsev. Lauren won the vacant WPBF and UBO female jr middles titles on scores of 59-56. 59-55 and 58-56. Halas down in the first, second and third before it was stopped. 40-35, 39-36 twice. Sniedze was down in the third. Parodi retained the IBF Int´l title on scores of 118-110, 115-113 and 115-113. Outah retained the French heavyweight title on a cut eye stoppage of Vieira, 29-28 Outah on all cards after three. Lovaglio won the vacant IBF Med cruiser title.